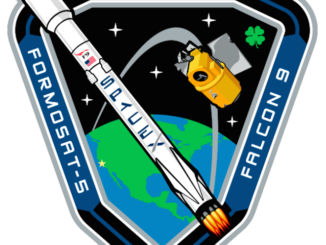 EDITOR’S NOTE: Updated at 2 p.m. EST (1900 GMT) after launch. Liftoff from Launch Pad No. 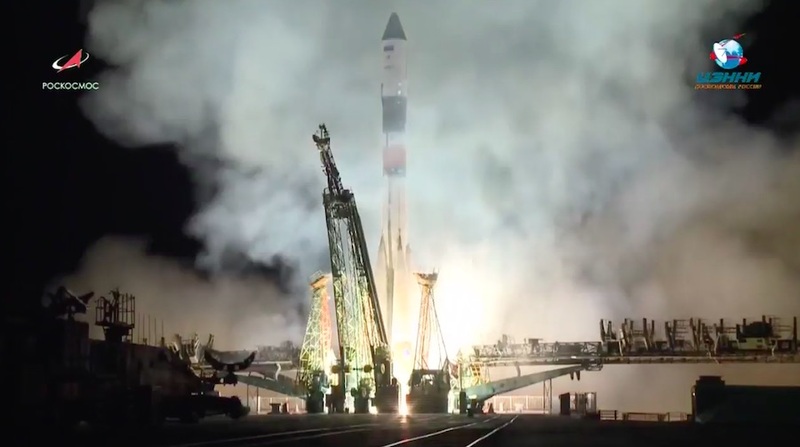 1 at Baikonur, the same departure point used by Yuri Gagarin on the first human space mission in 1961, occurred at 1814:08 GMT (1:14:08 p.m. EST) Friday as the space station sailed around 250 miles (400 kilometers) above southern Kazakhstan. The Soyuz headed northeast into a clear midnight sky at Baikonur, jettisoned its four first stage boosters, and accelerated into orbit using a third stage engine. Less than nine minutes after liftoff, the Progress freighter separated from the Soyuz third stage and unfurled its power-generating solar panels and navigation antennas. In a live broadcast of the launch, NASA officials said Russian ground controllers reported good power and telemetry on the Progress MS-10 spacecraft as it activated key systems for the journey to the space station. 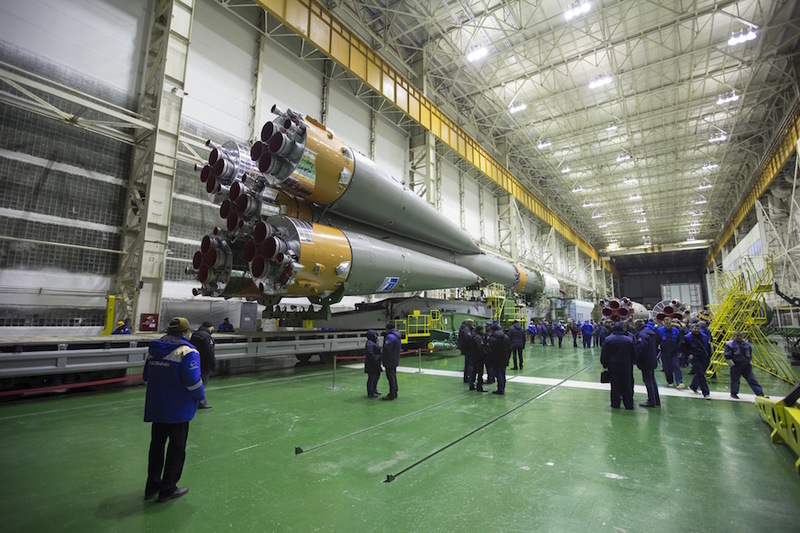 The Soyuz launcher that lifted off Friday flew in the Soyuz-FG configuration, the same variant of Russian’s most famous rocket used for liftoffs with crews heading for the space station. Friday’s launch was be the fourth Soyuz launch since a booster separation failure forced a Russian cosmonaut and a NASA astronaut to abort their launch to the space station Oct. 11, but the first flight since then to use the human-rated Soyuz-FG version. 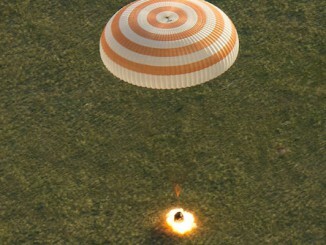 The two-man crew landed safely after the booster failure, which Russian investigators traced to a deformed sensor that was supposed to signal separation of the strap-on engine bays. Three Soyuz rockets launched since the Oct. 11 failure before Friday’s launch, but they used the Soyuz-2 version of the venerable launcher family, featuring an upgraded digital guidance computer and a different third stage engine. With the successful launch Friday carrying the Progress cargo mission, the Russian space agency is expected to give the green light for the next station crew launch Dec. 3, also using the Soyuz-FG rocket. The Progress MS-10 supply ship is scheduled to dock with the space station’s Zvezda service module at 1929 GMT (2:29 p.m. EST) Sunday, delivering more than 2.8 tons (2.5 metric tons) of equipment and commodities for the station crew. The spacecraft’s pressurized compartment is packed with around 2,866 pounds (1,300 kilograms) of dry cargo — food, clothing, provisions, experiments and spare parts. Those items will be manually unloaded by the station crew. The Progress also carries tanks containing around 1,653 pounds (750 kilograms) of propellant for transfer into the Zvezda module’s propulsion system, 970 pounds (440 kilograms) of water, 112 pounds (50 kilograms) of oxygen, and 53 pounds (24 kilograms) of air. A U.S. supply ship is set to join the Progress spacecraft in its pursuit of the station with a launch from Virginia’s Eastern Shore at 0901 GMT (4:01 a.m. EST) Saturday. The Northrop Grumman Cygnus cargo carrier is set for liftoff aboard an Antare rocket with more than 7,200 pounds (3,273 kilograms) of research hardware and supplies.